^ Mehta S (April 2006). “Disaster and mass casualty management in a hospital: How well are we prepared?”. J Postgrad Med 52 (2). https://tspace.library.utoronto.ca/bitstream/1807/6941/1/jp06028.pdf. ^ Slater RR (January 1970). 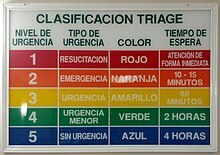 “Triage nurse in the emergency department”. Am J Nurs (Lippincott Williams &#38) 70 (1): 127–9. doi:10.2307/3421031. JSTOR 3421031. PMID 5196143.